I generally have the memory of a goldfish regarding books I’ve read, though it has dramatically improved since I started reviewing/logging every book on completion. But there are a handful I recall with pinsharp detail years later. 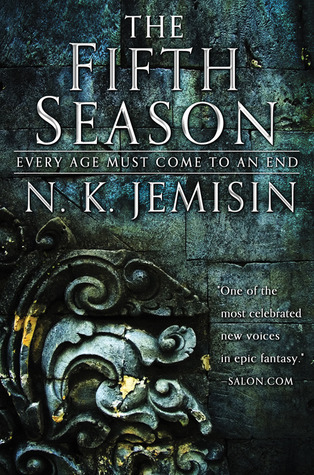 One of those is the first time I encountered Jemisin’s writing. I was sitting in Victoria Station, having just bought the book at Waterstones and waiting for the train home. Himself was seated next to me, also engrossed in a book, so Life was pretty much perfect. Especially as the opening passage of The Hundred Thousand Kingdoms hit me with the force of a sledgehammer – see my review here. Three terrible things happen in a single day. Essun, a woman living an ordinary life in a small town, comes home to find that her husband has brutally murdered their son and kidnapped their daughter. Meanwhile, mighty Sanze — the world-spanning empire whose innovations have been civilization’s bedrock for a thousand years — collapses as most of its citizens are murdered to serve a madman’s vengeance. And worst of all, across the heart of the vast continent known as the Stillness, a great red rift has been torn into the heart of the earth, spewing ash enough to darken the sky for years. Or centuries. Now Essun must pursue the wreckage of her family through a deadly, dying land. Without sunlight, clean water, or arable land, and with limited stockpiles of supplies, there will be war all across the Stillness: a battle royale of nations not for power or territory, but simply for the basic resources necessary to get through the long dark night. Essun does not care if the world falls apart around her. She’ll break it herself, if she must, to save her daughter. I’m conscious this sounds like yet another gritted struggle for survival in a land where civilisation has suddenly broken – an abiding staple of science fiction that has reached new heights of popularity, recently – but as with most really successful books, Jemisin has scooped up the basic concept and turned it into something uniquely her own. For starters, there’s the viewpoint. As a Creative Writing tutor, I spend a great deal of time telling new writers that addressing the reader in a magnificently detached authorial voice might have worked for Charles Dickens, but modern tastes dictate that it’s now a no-no. Unless you’re Jemisin, of course… She then launches her main protagonist at us in second person viewpoint, so we are experiencing Essun’s trauma as ‘you’. Frankly, my jaw was grazing the ground at this point and I did wonder if I’d manage to put this character voice on the backburner sufficiently to become engrossed enough that it simply didn’t matter, or better still – added to my enjoyment of the story. And, along with almost everyone I’ve met, I can report that by the time I was a quarter of the way into the story, it simply didn’t matter. I was so caught up in the story and the unfolding situation, I would have persevered if Jemisin had taken it into her head to omit every sixth word. Furthermore, there is a solidly good technical reason why Essun’s story is relayed in second person pov which I’m not going to elaborate further, as it would also be a thumping great big Spoiler. Suffice to say, it isn’t just some idle whim but matters to the narrative structure of the book. Along with Essun, there are a raft of vivid characters I really cared about – my favourite being the prickly, tormented Alabaster. The narrative arc of this story isn’t straightforward. There are regular flashbacks, that initially appear to be random interruptions to the ongoing storyline, as well as those omniscient intervals. It all comes together at the end in the shocking twist that still has me humming with pleasure at the symmetry of it all. And desperate to get my hands on The Obelisk Gate – which definitely won’t be hanging around for months on my TBR pile. I think all I can say in response to this is that I’m SO happy you finally read it and were just as floored by it as I was. 😀 Now I’m waiting for my pre-ordered copy of The Obelisk Gate to arrive so I can devour it as soon as possible (figuratively speaking, of course). I saw the Hugo Award news, but funny enough, your review is much more a recommendation than Hugo is ;). Thank you so much! I take that as a great compliment.